Most likely originating as far back as 3000 B.C., the breed is often depicted in Egyptian artifacts. The breed was used as a small game hunter but also served the purpose of being a loyal and loving companion of the Egyptian pharaohs. The breed was transferred from Egypt to the Meditteranian islands where it was preserved for 2000 years. The breed was imported to England in the 1960's where it then made its way to America Today the Pharaoh Hound is still a great hunter and guard dog but mainly serves as a companion dog. The Pharaoh Hound is the national dog of Malta. The AKC recognized the Pharaoh hound in 1983. 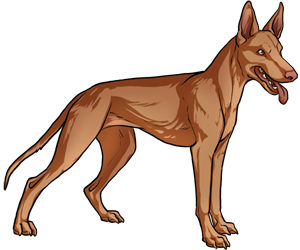 The Pharaoh Hound is called "Kelb Tal-Fenek" which means "dog of the rabbit" in Malta.